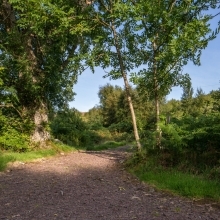 Applecross is an excellent location for coastal, mountain and forest walks, with a range of route lengths available to suit all levels of fitness and physical ability. Whilst walking in Applecross, please treat the environment and other people with respect. We highly recommend the use of Map Sheet 24 in the OS Landranger Map series while exploring the peninsula. For detailed access information, each trail has been mapped and potential hazards, surfaces, gradients and facilities recorded; this information is available from local outlets. All walks provide superb coastal and mountain panoramas, with opportunities for viewing wildlife. Many of the paths represent traditional transport routes of historic interest, and pass by sites of historic and archaeological importance. 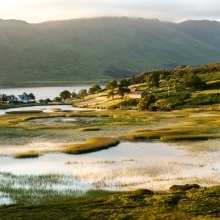 The Applecross Trust is a conservation charity with responsibility for 70,000 acres of the Applecross peninsula. 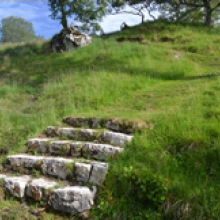 Improving access to the landscape is a key aim, with path building and maintenance a core activity. Booklets on the peninsula’s heritage, archaeology and geology are available from local outlets.